When I was first approached by Modern Grace Magazine, to which I am a fashion contributor, to interview my dad, a local artist by the name of James "Dewey" Dewhurst, I was excited. I was asked to try my best to interview him as a stranger. I know of his work because it's been showcased in his house for as long as I can remember, but to be honest, I didn't know much else about the art or the stories behind the pieces. I, honestly, didn’t know much about my dad as I later found out. In talking with him, I was amazed to learn of another depth to the man I call Dad. If there were a contest to determine who could be considered the most interesting man in the world, Dewey would definitely be a contender. Born in San Diego, California and in an Air Force family, Dewey moved around a good bit as a child. His dad's tour assignments exposed him to life in Japan for over a year until his parents finally settled down in Papillion, Nebraska where he graduated from High School. Upon graduating, he joined the United States Coast Guard and was stationed in Ashtabula, Ohio, where he met my mom. After getting married, my mom and dad moved to Baton Rouge, Louisiana where they started a family, and as they say, for me at least, the rest was history. For the interview, we agreed to meet at his home in Prairieville. When I first arrived, I noticed the same limestone statue in his front yard that had been there since my childhood. As I walked up the driveway, his signature on the side of the statue caught my eye for the first time. After all of these years, I had never noticed that before. Even now, I still can't believe he carved that! I suddenly wanted to know more about this piece and I was ready to learn more about the man and his art, because to me, he's always just been my dad. When Dewey opened the door, he was wearing one of the Hawaiian shirts he likes to wear and was very relaxed. "Come on in!" he said, and he gave me a big hug, as usual. We sat down in the living room and I started taking notice of several new paintings hanging on the walls. I felt like I was seeing so much for the first time. The statue in your front yard is remarkable! Tell me more about its history. Dewey: Oh, yeah, the limestone man. I carved that in college. The limestone came from the old Paramount Theater, downtown. The year was 1986 and I was at LSU. A professor of mine actually gave me that limestone. It took me about three and a half months to carve. Where did you get the inspiration for the design? It's so unique! Dewey: Well, I had no plans on what I was going to carve when I started. I actually imagined myself as a guy sitting on a wave on the beach and started the design based upon what I was feeling in my life at the time. If you notice, when you go back outside, the hands on the statue are extra big. I did that to symbolize me working on the statue because I was using my hands to do it. On a side note, limestone is relatively easy to shave and I actually used a pneumatic chisel on it. It made the process quicker and it cut away at the stone much easier. That is amazing. All these pieces here as I'm looking around, they are all so different. No two paintings are alike. Dewey: No, none of my paintings are the same. Each one tells a story and each one is different. A lot of thought goes into each piece. When did you first discover you had a gift and a love for art? What inspires you? Dewey: Well, I started out in second grade drawing pictures of battles in pencil. That kind of progressed to art classes later on in 7th grade and then a poster contest that was put on by the American Red Cross in 1969 I decided to enter, and actually ended up winning. I have a picture of it here. These are the actual stamps that were printed. My inspiration is what's going on around me. My life. Pop culture. You know, just everyday happenings. Media is just a vehicle to get to the expression or thoughts. I know you spent time in Afghanistan both in the military sector and on the civilian contractor side. Tell me a little more about that. blood. I don't know what it is about the atmosphere or the people, but I just didn't want to be back in the U.S. and back at my normal job. I jumped at the chance to go back overseas and didn't come back home until March 2013. All that time in Afghanistan? Dewey: Yes, all that time in Afghanistan and then, can you believe it, I still didn't retire! I actually took a job in Ohio working for G.E. after my time overseas and I did that until January of this year when I finally decided it was time to officially retire and focus on my Art 24/7. Fascinating! Did you draw any inspiration from Afghanistan for any pieces? Dewey: Oh, no doubt. I have this piece here that I did in pen and ink of a little girl in Afghanistan. I was in Salerno on the far west end of the base and we were surveying the land near a cemetery. There was this fence up and this little girl had come to the fence to show off her new book sack and books because she was going to school for the first time. I decided to take a picture of her and then did the drawing from the picture. I actually worked on the drawing while I was in Salerno working the night shift. It took me about a month or so to complete working on it almost every night. I actually don't have those pictures anymore either, which is a bummer. My external hard drive with almost all of my pictures from Afghanistan ended up getting ruined while I was over there. I have the memories, though. I see that a good bit of your paintings have very interesting looking frames. Did you make those yourself? What kind of wood is that? Dewey: Yes, I make the majority of my frames myself for the paintings. This one over here with the hand going up to the tree is made of cypress out of the bayou. This one over here, called Maurepas Moon, also is made of cypress and as you can see, I've carved the name of the painting into the wood. I put a lot of dedication and time into everything I make. Which do you prefer, painting or sculpting? Dewey: I like them equally as well. All take time and all take inspiration. Dewey: Yes, this painting here. I'm just about done with this one. Just a few more touches. 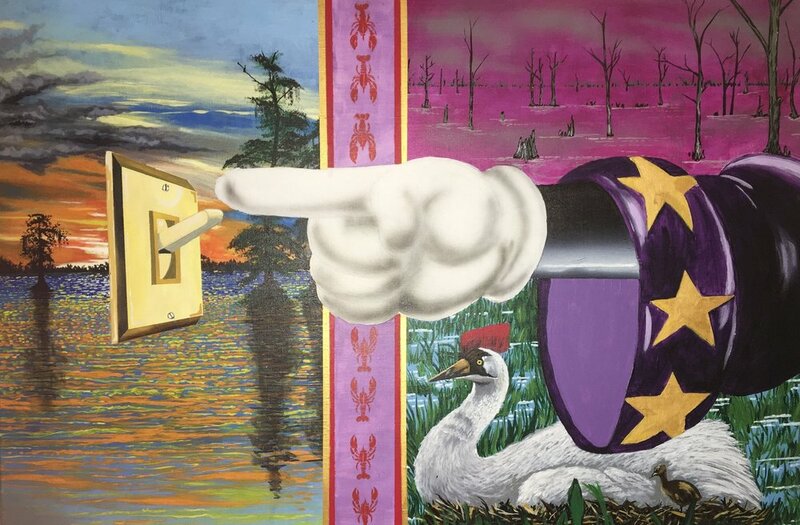 This is a painting that is a reflection of saving the Louisiana coast. You can see the coastline here and then the light switch and I'll let you figure out the rest. Do you feel that your life experiences have inspired your art? Dewey: Definitely, it's my life that I draw from. I can look at older pieces of mine and reflect immediately as to what was going on at that time. Then again, sometimes I just want to express a feeling. A painting I have hanging in the hallway, called Election 2016, is the feeling of the circus atmosphere in the election and my sentiments about what I felt were poor choices for the candidates. I inserted poppies to symbolize the blood of soldiers that have fought to preserve that right to elect our government. Wow, look at this piece! You made this frame, too, I take it? Dewey: Sure did. I like to make my own frames to go with my paintings. It completes the piece. Do you plan to sell any of your art? I see that you have a good bit of it displayed here throughout the house.